We are incredibly proud to advise that Stanley Halls has been included as a case study in English Heritage’s hugely influential ‘Pillars of the Community’ booklet, or as we think of it, the bible for heritage asset transfer of buildings from councils to communities. 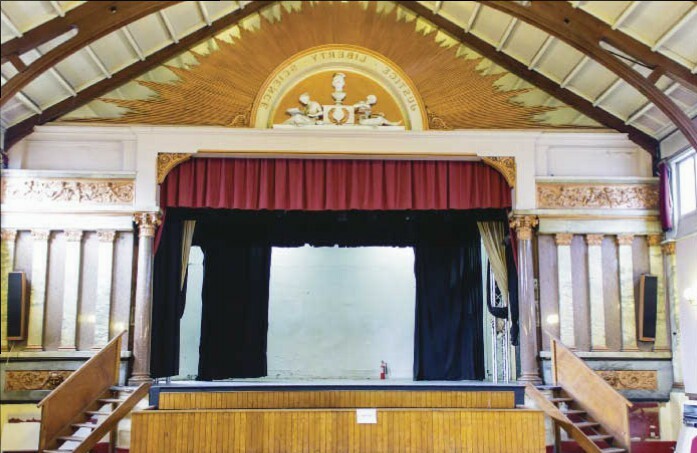 The concert hall stage, the image English Heritage thought best represented Stanley Halls (image: Angie Davila). In the meantime, your ever-faithful, if increasingly weary, SPI board continue trudging through negotiations for the management lease for Stanley Halls and surveys with Croydon Council. This once seemingly never-ending stage now appears to be coming to a head with the Council’s Executive Director for Environment and Development now taking an active role in supporting the asset transfer. So things are starting to happen and SPI signing the lease and the community taking management of this wonderful community and historic asset is now on the horizon. A recent change in Council administration has also seen a new focus on arts and the economic development for South Norwood; this should be of great benefit to Stanley Halls and, in turn, we hope the Halls will play a significant role in turning around the fortunes of the area. Thanks to very many of you for helping to get us this far. We’re so nearly there. I leave you with a photograph of the freshly painted and stunning gallery at Stanley Halls – painted by 60 local teenagers from The Challenge Organisation, using colours discovered to have been previously used in this room. A photo can’t do it justice. 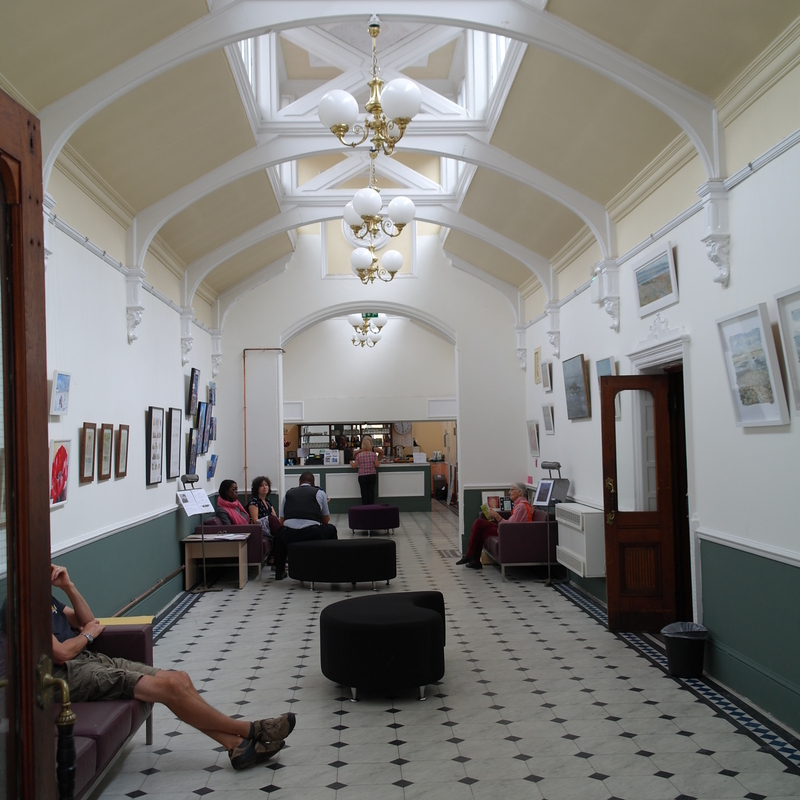 The newly decorated gallery at Stanley Halls. The people of South Norwood take a bow. All those years of voluntary work have been recognised and the Charity Commission has granted SPI charitable status (yippee). This month, SPI was registered as a charitable incorporated organisation – a new form of charity particularly suited to the type of structure needed to run major projects such as these extensive public halls. It removes a cumbersome level of bureaucracy and allows organisations to focus on the task in hand – making a project like this one live and breathe! The new status means we will be able to sign the lease agreement after a few final negotiations and some essential works to the Halls by the council. Anyone who came along to fabulous Steve Knightley gig a few weeks back will be aware of the problem of the collapsed drains limiting toilet facilities, but the works are now in hand. We and the council are eager to transfer the lease on the Halls and get them fully open to the public so they can become a vibrant hub in the area. Until the handover there will be occasional public events, which we are managing, this is a great way for us volunteers get valuable experience of how the Halls tick. Stanley Halls will open to regular hirers when we formally take on the lease and can provide a full management service. This should be during the Summer. “Now it really feels as if the community is going to take management of Stanley Halls. It may have looked to outsiders as bit of a pipe dream, but it is finally going to happen. We just need the Halls to be in a fit enough state for us to open the doors to the public, and the council has those works in hand. We owe a huge thanks to our large band of supporters; together we have built this community-led charity from nothing and soon Stanley Halls will once more fulfil its potential. The Charity Commission is rigorous in its scrutiny so our board is delighted that the new status was agreed so quickly. Unusually, and due to a historical quirk, we have formed the second charitable trust in relation to Stanley Halls, which could have slowed the application down. The initial trust was set up in 1905 by Halls founder, William Ford Stanley, and is currently administered by Croydon Council. Council officers, worked closely us and supported the Commission with its enquiries to show how the two trusts could work together and would be of benefit to the local community. Now we need to hear from hirers. Tell us what you want to do in the Halls and we can start scheduling events. Contact us here. Happy birthday SPI, you’ve done a heck of a lot in your short life. From starting life as a group of interested local residents with a passion to take on Stanley Halls but no idea of what to do, to being on the verge of forming a charity which will open the Halls to the public later this year. That takes a lot of commitment and hard slog. If nothing else, this project has shown the streak of bloody-mindedness in the people of South Norwood to get Stanley Halls open. I want to thank all the 170 or so Friends of SPI supporting this project, and in particular the 20 of them who have sweated blood and tears to get it to this stage – the Steering Group. It’s also a poignant time for us. With more than a few sobs we have just disbanded the Steering Group. Having 20 feisty folk making decisions on how to get Stanley Halls up and running is good at first, but for a business moving forward we now need a tighter board of 11. Fear not, we don’t lose all the skills of the former Steering Group; we have working parties galore and there’s too much talent there to let it slip through our fingers. I am an Accountant who has lived in South Norwood over 20 years. I am currently Deputy Chair of TEPERA (230 households) in addition to being its Social Secretary and Environmental Officer for the last 10 years. I am also on the Steering Committee. I have a passion for the Arts and bringing people together. Stanley Halls represent the heart of a diverse Community which I passionately believe it can continue in an increasing capacity. Moving to South Norwood in 1970, I remember the Halls as a thriving venue. I have been secretary of SPI since its beginning, done research into some of Stanley’s paintings and I am working to bring the Gallery alive with Café,Bar, art exhibitions and lunchtime concerts. Before retirement, I taught music, lectured in Music Education, and was school governor for 10 years. I have been secretary of TEPERA for 20 years and established an No Cold Calling Zone for members. When I moved to South Norwood two years ago, I was immediately attracted to Stanley Halls and the potential that it has to be the heart of this community. I am a museum professional and academic (specializing in visual culture during the 19thC) and feel I have many skills to offer SPI. Since January 2013 I have been fundraising officer bidding for small grants and working hard towards getting substantial money from major funders. I have chaired SPI from its beginnings as a keen interest group to where it is forming a charitable business and bidding for millions. I have lived in SE25 for over 20 years, for a couple of which I worked developing local business. So I want to see new enterprises in the Halls bringing money to the area. I’m experienced in project management, staff management, community engagement and developing community-led businesses. 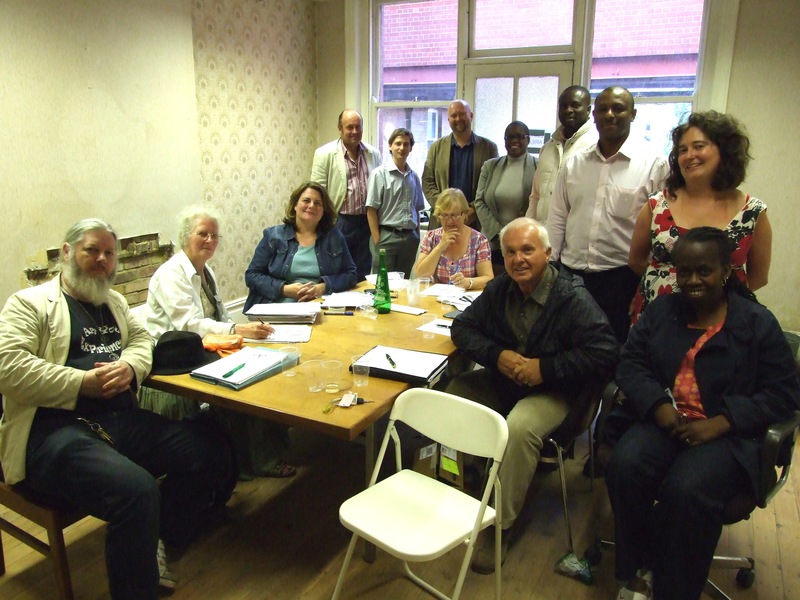 I have volunteered in South Norwood for sometime, which has given me insight into the aspiration of our community. I will work hard to engage and support the development of the Charity. I have been an avid volunteer with SPI. I have practical experience as a Trustee of Waterloo Action Centre and Holy Innocents Church. I hope to add to the diverse melting pot of the Board as I am a Charity Solicitor. I have lived in SE25 for twenty years, after ten years in SE19. I am a drama teacher, with thirty years in Croydon schools. I worked for eight years at the ILEA Cockpit Theatre & Arts Workshop in NW8. I’m a former chairman of London Drama, director of No Kidding (an integrated performance company) and author of Drama to Inspire. I believe Stanley Halls should be SE25’s community focal point. I am an accountant with considerable experience working for major financial institutions, mainly in the City of London. I am also heavily involved in performing arts, film, animation and community work both in the UK and Jamaica. I am an enthusiastic supporter of the Stanley Halls project. I believe the many benefits it will offer, such as a place for development of local arts and young people, is urgently needed. Since becoming part of the Steering Group in 2011, I have written or contributed to various policy documents. I have also functioned as the central person compiling budgets and forecasts. I’ve lived in South Norwood for many years. I’m passionate about preserving history but want this to dovetail with much needed regeneration for the area – Stanley Halls is definitely part of that vision. I bring commitment, together with business development and programme management skills, as well as experience working for an international charity. I now work for the NHS, where I have lead on a number of projects and programmes aimed at improving services. As the chair of People for Portland Road I made the initial application to the Council calling for Stanley Halls to be returned to our local community. I’ve been involved ever since as SPI’s vice-chair, using my experience as an architect to design our development proposals and using my position as a local Councillor to secure our permission to go ahead. I joined SPI in February 2012, I have been involved in the performance and marketing hubs; contacting performers that would like to come to the Halls, helping to formulate marketing strategy and helping selecting the box office system. I studied theatre at Rose Bruford College, I used to hire out theatre equipment to the local community, which is how I came to know the Halls. I worked at a similar community centre venue in the past. Also, we have one board place for a local Councillor standing in that capacity. We asked the 9 Councillors in the SE25 wards (South Norwood, Woodside and Selhurst) to nominate one of their members and Councillor Kathy Bee makes our final board member. Kathy is also SPI’s Treasurer and Leads the Community Hub. You can email any of the above board members by using this link. We’d like to hear how you would like to use Stanley Halls.